Trademarks are words, names, symbols or devices that are used in trade with goods to indicate the source of the goods and to distinguish them from the goods of others. This is different than a service mark. A service mark is the same as a trademark except that it identifies and distinguishes the source of a service rather than the source of goods. Trademark rights may be used to prevent others from using a confusingly similar mark. However trademarks do not to prevent others from making the same goods. Trademarks also do not prevent the selling of the same goods or services under a clearly different mark. Trademarks that are used in interstate or foreign commerce may be registered with the United States Patent and Trademark Office. You should be aware of a few items before filing for a trademark registration. First, you should have Kaliko & Associates, LLC perform a search of all federal registrations, state registrations, and common law uses of your mark. This is done in order to see if the mark has already been registered or is being used in commerce. Secondly, it should be noted that merely searching the United States Patent & Trademark Office web site for similar marks may not be enough to ensure that your mark can be registered. This is because trademark rights are established through their use in commerce, and not merely by registration. However, one benefit of registering your mark is that such registration provides constructive notice to others of your use of the mark in commerce. The most distinctive marks are those which are arbitrary or fanciful. Arbitrary marks are those which have no relation to the goods. An example of this would “IPOD” for portable digital media players. Fanciful marks that are made-up or coined (e.g. erox). As long as they are not confusingly similar to other marks, arbitrary or fanciful marks typically have the highest level of protection. On the opposite end of the spectrum of distinctiveness lie generic marks. “Generic Marks” are the common name for the product or service. Generic marks are incapable of protection under trademark law. This is because others need to use the common name to compete effective. As a result, one cannot claim trademark rights in the word “desk” to identify the supplier of a desk. Although protection is available for trademarks is available under state law, a higher degree of protection is afforded through registration of the mark in the U.S. Patent and Trademark Office. Federal registration allows the owner of the mark to display the familiar symbol and thereby putting others on notice of trademark rights. Trademark rights are no longer restricted to state boundaries. A first user of a federally registered mark is entitled to nationwide protection. Federal registration grants the trademark owner access to federal court. In causes of action for trademark infringement of federally registered marks, profits, damages, and costs of the law suit are recoverable and triple damages and attorneys fees are available. A federal registration may be grounds for stopping importation of goods bearing an infringing mark. If you would like us to perform a search for your prospective trademark or file a trademark application for you, please call us at 201-739-5555 for a free consultation. Is registration of my mark required? 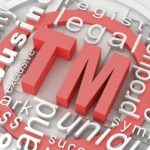 When can I use the trademark symbols TM, SM and ®? You may use the “TM” (trademark) or “SM” (service mark) designation to alert the public to your claim any time you claim rights in a mark. This is regardless of whether you have filed an application with the USPTO or not. However, you may use the federal registration symbol “®” only after the USPTO actually registers a mark , and not while an application is pending. Also, you may use the registration symbol with the mark only on or in connection with the goods and/or services listed in the federal trademark registration. Call for a free trademark consultation 201-739-5555. We look forward to serving you.